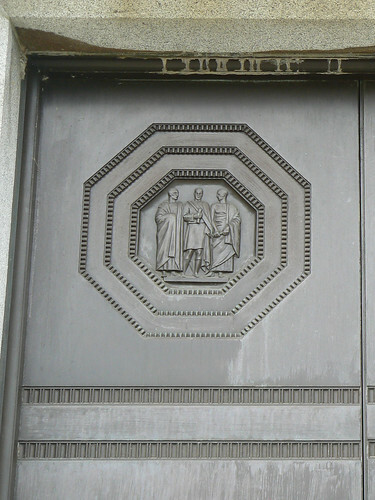 Beaverdale Apartments in Montreal has these amazing decorative sections around the main entrance and nearby windows. 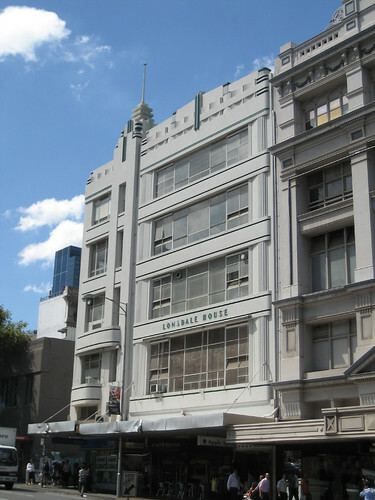 Torbay Apartments in Perth have undoubted Art Deco styling but I can't tell whether they are old or new. I can't put my finger on it but I wouldn't be surprised if the building was 70 years old, nor would I be surprised if it was 7 years old. 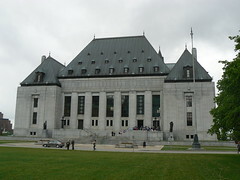 The Supreme Court of Canada in Ottawa was designed by Ernest Cormier and constructed in 1939. 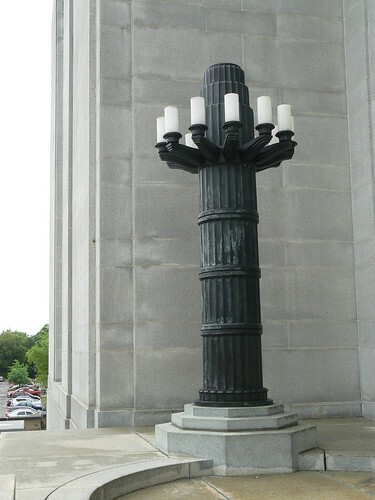 The building is flanked by two large multi-arm lamps which mark the location of the large bronze doors that lead into the entrance hall. 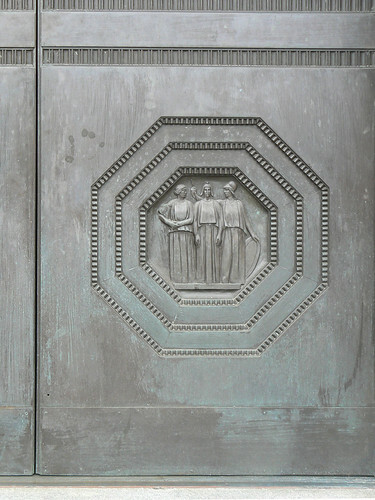 These doors have six octagonal forms bearing various figures. 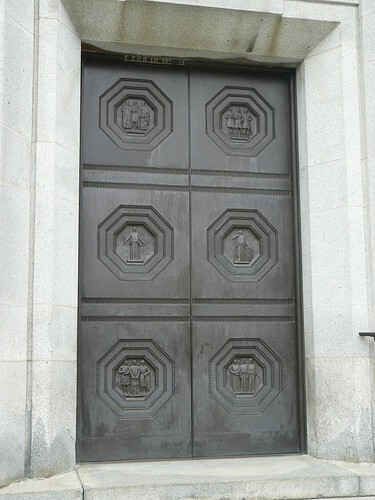 The Soldiers Memorial in the Bendigo suburb of Kangaroo Flat has this lovely Art Deco style brick entrance. 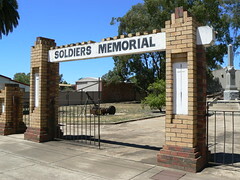 In a way I like the solid beam of timber bearing the text "Soldiers Memorial" and the simple crosses in the niches on each of the gate posts better than the brickwork. 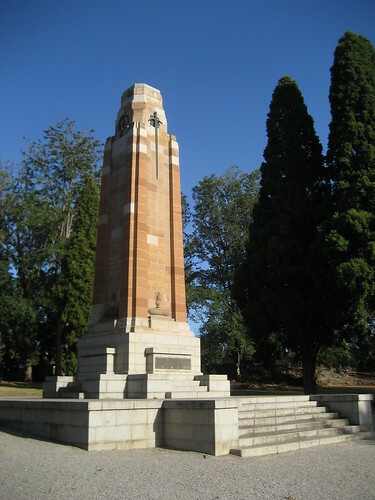 I think all the elements work together well as a suitable entrance to the park area containing the memorial monument. 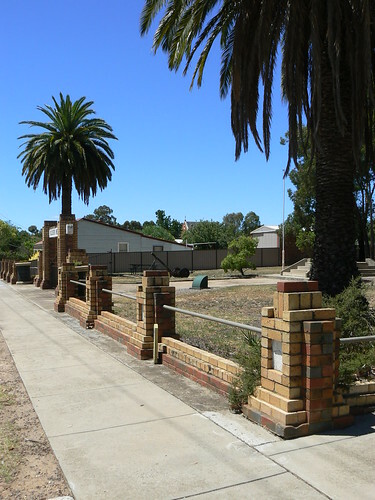 The remainder of the park is enclosed by a fence consisting of smaller versions of the gate posts joined by a single metal rail. 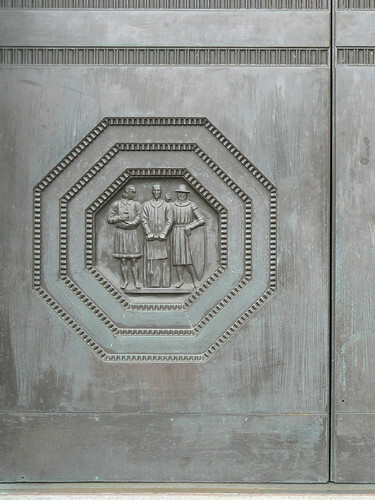 Inscriptions have been added to cover WWI and conflicts in Korea, Malaysia and Vietnam. 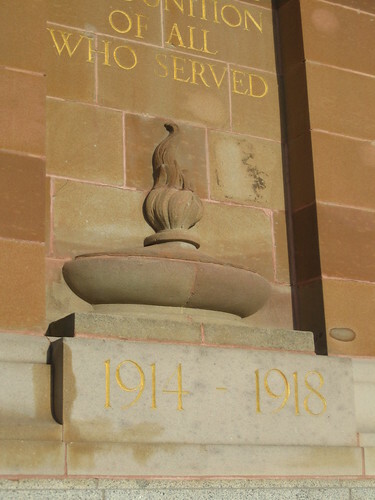 On each face there is a relief sculpture of an oil lamp with three of the sides bearing the words PEACE, DUTY and VALOUR with the fourth face bearing the years of the First World War, 1914 - 1918. 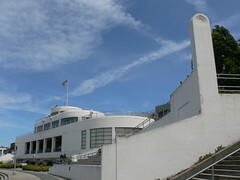 The Maritime Museum in San Francisco is housed in this wonderful streamline former bathhouse in Aquatic Park. The bathhouse was originally built between 1936 and 1939 as a WPA project and the lines of the building are as much those of a ship than any building you are likely to see. 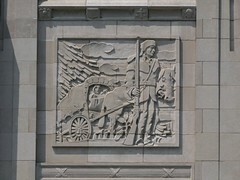 It features some amazing Sargent Johnson murals and has undergone a major renovation in the past 4 years and is expected to re-open with exhibits later in 2010. 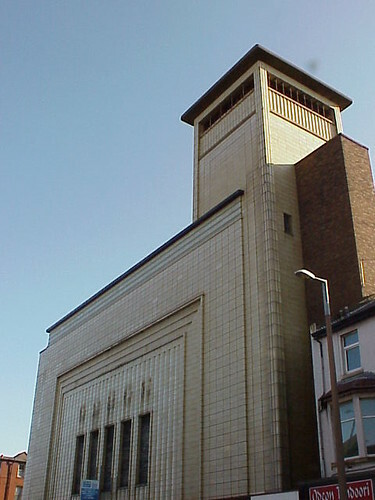 The Odeon Theatre in Blackpool opened in 1939 and was designed by W Calder Robson and Harry W Weeden. 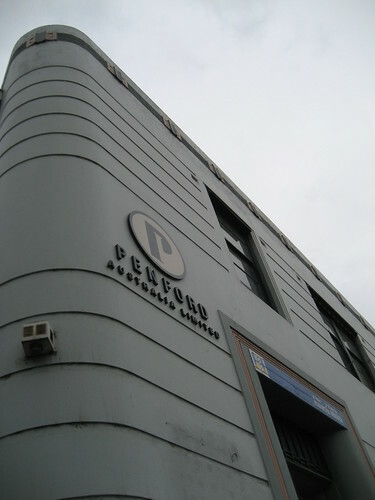 I caught it at it's lowest ebb in 2000-01 a few years after it had closed but it lives again as Funny Girls, the main venue for a drag show. 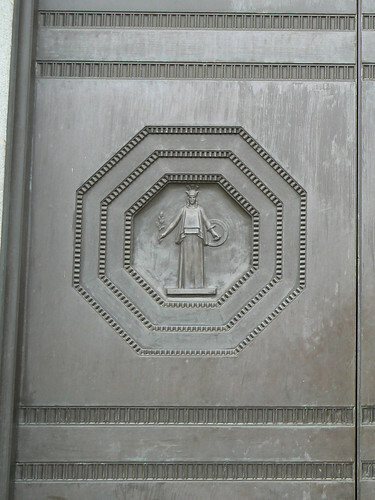 The photo gallery on their website shows the deco interior in wonderful condition. 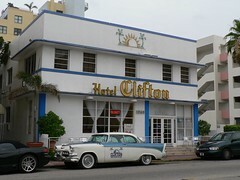 The Hotel Clifton in Miami South Beach has a very simple streamline facade with virually no decoration. 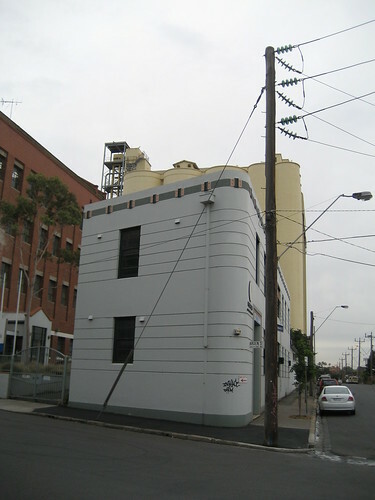 In fact, there are only two concrete shelves above the ground floor and second storey windows and that is about it. 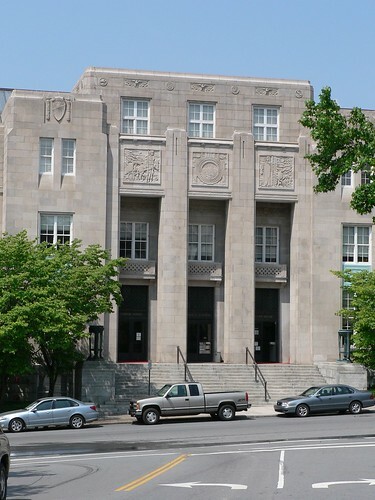 This is the Federal Court House in Asheville, North Carolina. 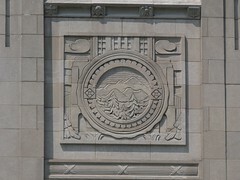 The highlights of the building are the eagle motifs along the roofline and the three frieze panels depicting a settler family and a native american family either side of a version of the Asheville City Seal. Recently I posted a photo of an apartment block in Reba Anseba Street, Asmara. 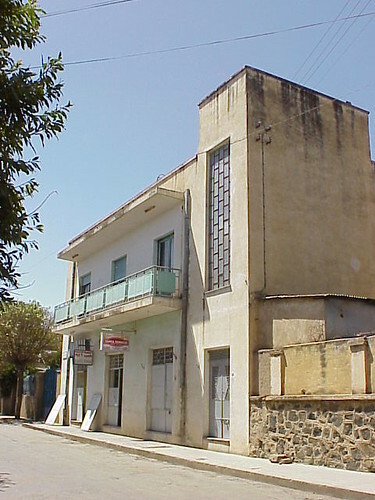 These shops are also in Reba Anseba Street, perhaps demonstrating just how ubiquitous this style of Modernist building is in Asmara. 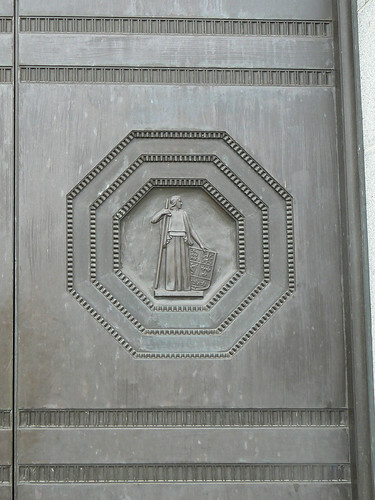 This building also features local metal work on the doors and shutters for the windows. There are two on the footpath leaning up against the wall. 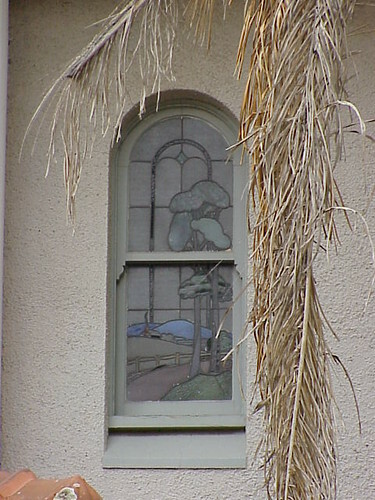 Also note the simple geometric pattern of the glass panes in the window of the tower on the nearside of the building. 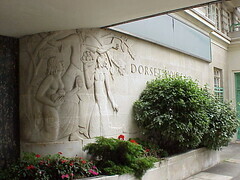 During a World Congress on Art Deco you see many buildings and frankly, it is sometimes difficult to remember them all. 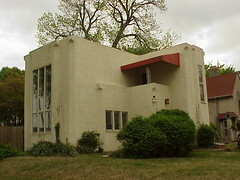 This is a house in Tulsa that we visited during the 2001 Congress. 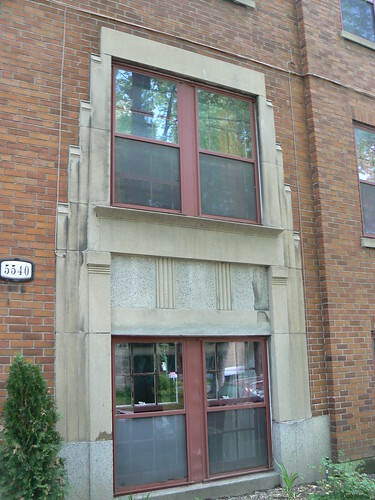 I find it difficult to remember anything about this house, it doesn't even look very deco to me. 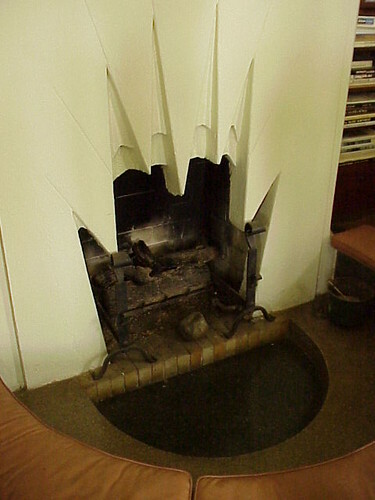 I reckon this fireplace might of had something to do with why we came to this particular house. 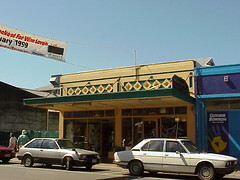 This great little Art Deco shop is in Hastings on the north island of New Zealand. Like nearby Napier, Hastings was devastated by an earthquake in 1931. 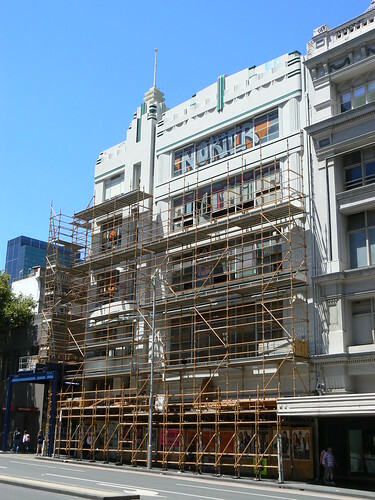 A major rebuilding effort in the Hawke's Bay area meant that many buildings were constructed in Art Deco style. 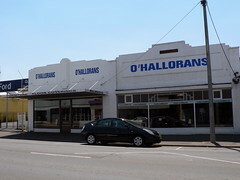 I like the absence of signage on the front of the verandah that maight obscure the lovely detailing in on the shop facade. 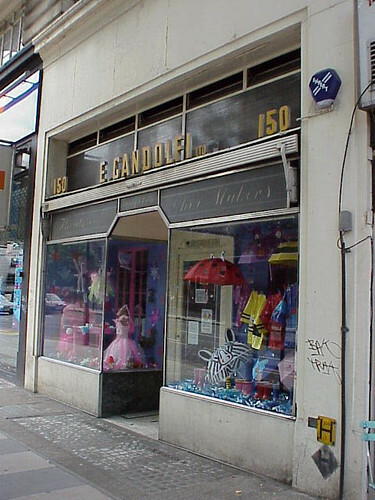 I took this picture in 1999 so I wonder how the shop has changed in that time. 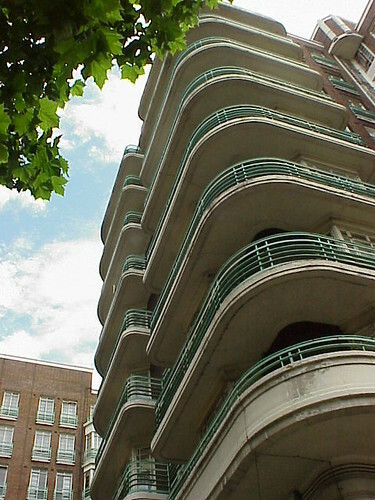 Dorset House is a monumental block of Art Deco flats in Marylebone. 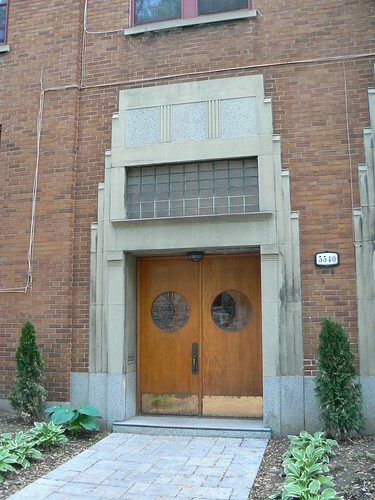 Dating from 1935, it was designed by T P Bennett and Joseph Emberton. 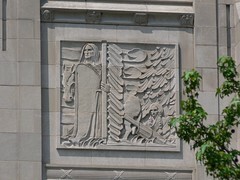 There are large reliefs on either side of the main entrance and the corner flats have large rounded balconies. 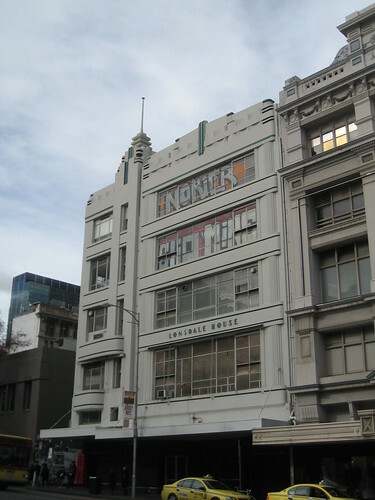 The complex includes shops at street level and some of the original deco shopfronts survive. 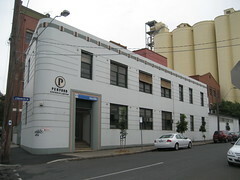 Penfold Australia Ltd occupy this Art Deco building onthe corner of Elizabeth and Arden Sts in North Melbourne. The main part of the facade has limited decoration consisting of incised lines defining the horizontal sweep of the windows at ground level and the second story. 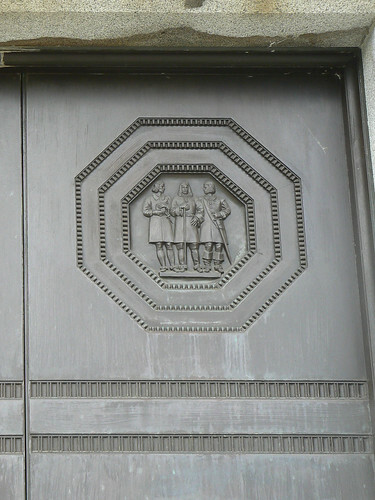 There is simple banding around the doorway and around the top of the building where a repeated plaques providing the majority of the building's decorative interest. These apartments are in Ruba Anseba Street in Asmara. 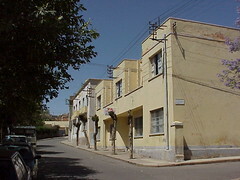 They are typical of many Modernist apartments built in Asmara during the later years of Italian colonalisation prior to WWII. 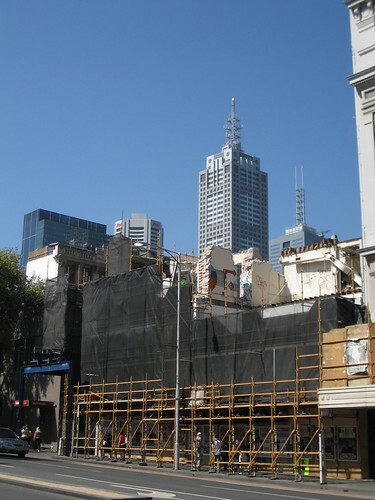 I especially like what appears to be loggias or pergolas on the second floor balconies. 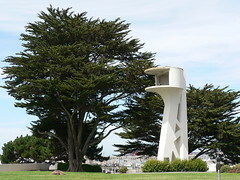 One of the Judges towers at the Aquatic Park in San Francisco. 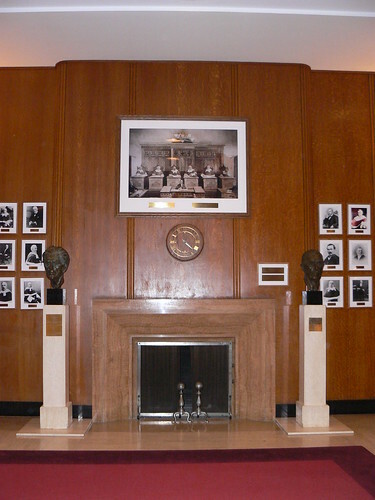 The Judges' Gallery at the Supreme Court of Canada in Ottawa houses photos of current and former judges as well as busts of people important to Canada's judicial system. The room features wood panelling almost to the ceiling and this simple fireplace as a focal point. 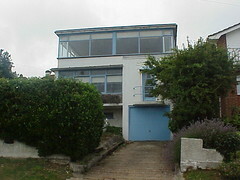 I decided to post this Modernist house in Saltdean because I've recently heard that the wonderful Art Deco Lido in that small town in the south of England is under threat from developers who plan to fill in the pool and built over 100 flats on the site. 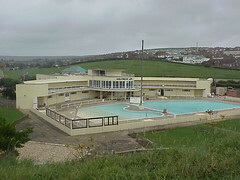 I wrote about the Saltdean Lido last November having visited there in either 2000 or 2001. It is a majestic building with the large pools in front. There is a campaign underway to try to save this great example of British summer holidays. Details of public meetings held in the area have been written up in The Argus newspaper with one option proposing that a public consortium purchase the Lido and operate the facility. 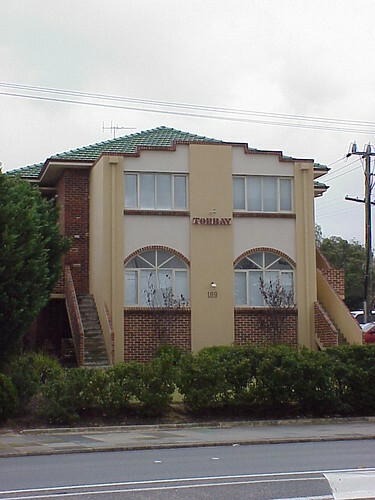 The building is heritage listed but that does not include the swimming pools. For more information on the Campaign to Save Saltdean Lido visit http://www.saltdeanlidocampaign.org.